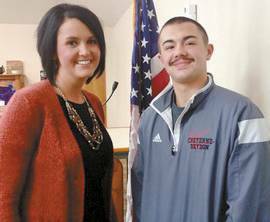 By Pat VerSteeg — This past Tuesday Kiwanis/Senior Citizens honored the CHS November Student of the Month, Tanner Leach. CHS Principal Whitney Moore introduced Tanner as a man of many accomplishments, however, one that stands out and that speaks so much of his character is his commitment to his country. “At the end of his junior year Tanner joined the National Guard and for this I am so proud of him,” said Moore.